"Greiser" redirects here. For the German footballer, see Dirk Greiser. 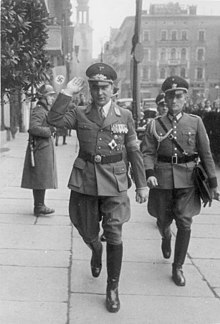 Arthur Karl Greiser (22 January 1897 – 21 July 1946) was a Nazi German politician, SS-Obergruppenführer and Reichsstatthalter (Reich Governor) of the German-occupied territory of Wartheland. He was one of the persons primarily responsible for organizing the Holocaust in occupied Poland and numerous other crimes against humanity. Arrested by the Americans in 1945, he was tried, convicted and executed by hanging in Poland in 1946. Greiser was born in Schroda (Środa Wielkopolska), Province of Posen, Imperial Germany, Greiser was the son of a minor local bailiff (Gerichtsvollzieher). He learned to speak Polish fluently during his childhood. In 1903, he enrolled in elementary school, which was followed by two years of intermediate school and finally the Königlich-Humanistisches Gymnasium (Royal Humanities Secondary School) in Hohensalza, which he left in 1914 without receiving a diploma. In August 1914, he volunteered to join the Imperial German Navy. He served in the Kiel harbour naval forts at Korugen, Falckenstein, and in the fortress tower of Laboe from August, 1914 to July, 1915. He was then assigned as an artillery observer in Flanders as well as participating in minesweeping operations in Friedrichsort. In April, 1917, he volunteered for service in the Naval Flying Corps where he initially served as an observer with SEE I and II and then with Küstenfliegerstaffel I and II. From August, 1917 to August, 1918, he was assigned as a naval aviator to Marine Schutzstaffel I. During this time, he was transferred to Seeflugstation Flandern II (Ostende) and he later flew with the Seefrontstaffel and MFJ IV. From December, 1917 to January, 1918, he was attached to the KE-Schule Langfuhr (near Danzig, now Gdańsk). While deployed to combat duty, he flew missions over the North Sea between the southern English and Belgian coasts. He was later shot down and wounded by gunfire. On 30 September 1919, he was classified as 50% war-disabled and discharged from naval service. He earned the Iron Cross (First and Second Class), the Honour Cross of the World War 1914/1918 and a Wound Badge in Black in 1914. From 1919 to May 1921, he served in the Freikorps Grenzschutz Ost and fought in the Baltic states. Greiser was fanatically anti-Christian and an early member of the Nazi Party (number 166,635). After many years with the nationalist Deutschsoziale Partei (DtSP) founded by Richard Kunze and membership in the Stahlhelm in the mid-1920s, he joined the NSDAP and SA on 1 December 1929, and the SS on 29 September 1931. He was the Senate President (Senatspräsident) of the Free City of Danzig (Gdańsk, Poland) in 1935–1939, and the administrator (Reichsstatthalter und Gauleiter) of Reichsgau Wartheland (1939–1945). As Senate President of Danzig, he was described as a "hothead"and was a serious rival to his nominal superior Albert Forster, Gauleiter of the city since 1930. 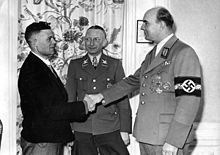 Greiser was part of the SS empire whilst Forster was closely aligned to the Nazi Party Mandarins Rudolf Hess and later Martin Bormann. Greiser was directly responsible for escalating tensions between the Free City and the Republic of Poland in 1939. When the Polish Foreign Affairs Minister Józef Beck threatened economic reprisals following the harassment of Polish frontier guards and customs officers, Greiser issued an announcement on 29 July 1939 declaring that the Danzig police no longer recognised their authority or power, and demanded their immediate withdrawal. The notice was so rudely worded that the Polish diplomatic representative to Danzig, Marian Chodacki, refused to forward it to Beck and instead sent a court summary. Reviewing the troops in Poznań, November 1939. Greiser is on the right with Wilhelm Frick (center) and Generalmajor Walter Petzel (left). Immediately following the German invasion of Poland, Greiser was transferred from Danzig and appointed "Chef der Zivilverwaltung im Militärbezirk Posen" or Chief of Civil Administration in the military district of Posen, which was annexed to the German Reich on 8 September 1939. The military administration ended the following month, and he was then appointed Gauleiter (21 October) and "Reichsstatthalter für den Reichsgau Posen" (26 October). On 29 January 1940, the region was renamed Reichsgau Wartheland. The territory was potentially very rich – the Prussian Imperial province of Posen had been the breadbasket of Wilhelmine Germany before 1914, possessed an excellent rail and road network, and a comparatively healthy and well educated workforce; Litzmanstadt (Łódź) had developed a fairly sophisticated industrial base during the 19th century. Although every Gauleiter was expected to fully Germanize his assigned area by any means, Greiser emphasized brutality to achieve this goal. He was an ardent racist who enthusiastically pursued an 'ethnic cleansing' program to rid the Warthegau of Poles and to resettle the 'cleansed' areas with ethnic Germans. This was along the lines of the racial theories espoused by Reichsführer-SS Heinrich Himmler. Mass expulsions of Poles from the Warthegau to the General Government and summary executions were the norm. A Polish servant in Greiser's house described him as "a powerfully built figure. He was a tall man, you could see his arrogance, his conceit. He was so vain, so full of himself—as if there was nothing above him, a god, almost. Everybody tried to get out of his way, people had to bow to him, salute him. And the Poles, he treated them with great contempt. For him the Poles were slaves, good for nothing but work". Greiser himself stated his beliefs: "If, in past times, other peoples enjoyed their century-long history by living well, and doing so by getting foreign peoples to work for them without compensating them accordingly and without meting out justice to them, then we too, as Germans want to learn from this history. No longer must we stand in the wings; on the contrary, we must altogether become a master race!". Arthur Greiser in March 1944 welcoming the one-millionth Volksdeutscher resettled from East Europe to occupied Poland as part of the "Heim ins Reich" campaign. Greiser was also involved in the resettlement of German refugees from lands annexed to the Soviet Union in 1939 and 1940. Between October and December 1939, nearly 60,000 Volksdeutsche arrived in Germany from the Baltic states of Estonia and Latvia. Evidently Wilfried Strik-Strikfeldt (later employed as translator for General Andrey Vlasov) was in this group, as he "resettled" in Posen. Neighbouring Gauleiter and rival Albert Forster refused them entry, and they were largely settled in properties seized from Poles in Poznań and across the Wartheland. However even Greiser was wary, noting that many were elderly and urbanized aristocrats with a strong class consciousness, not the virile peasant warrior types idolized by the SS. Closer to his heart were the over 100,000 Volksdeutsche who were evacuated from Volhynia and eastern Galicia. These were mostly farmers and rural people, and, learning from the Baltic experience, Łódź in eastern Wartheland was designated the main Volksdeutsche Mittelstelle (VoMi) reception centre. In May 1940 a further 30,000 Volksdeutsche were relocated from the Nazi General Government of Poland to Greiser's domain. After 1941 a further 300,000 Volksdeutsche were evacuated from Russia and Ukraine to Wartheland during the German invasion and occupation of the Soviet Union. Greiser's Poznań was considered the Germanised city par excellence, and on 3 August 1943 he hosted a national gathering of Gauleiter and senior Nazis, including Martin Bormann, Joseph Goebbels and Heinrich Himmler. Richard J. Evans wrote that the Catholic Church was the institution that, "more than any other had sustained Polish national identity over the centuries". The Nazi plan for Poland entailed the destruction of the Polish nation. This necessarily required attacking the Polish Church, particularly in those areas annexed to Germany. Greiser, with the encouragement of Reinhard Heydrich and Martin Bormann, launched a severe attack on the Catholic Church. He cut off support to the Church from the state and from outside influences such as the Vatican and Germany. In July 1940 he instituted Bormann's anti-church "thirteen point" measures in the territory. The anti-church measures, which had Hitler's approval, suggest how the Nazis aimed to «'de-church' German society». Catholic Church properties and funds were confiscated, and lay organisations shut down. Evans wrote that "Numerous clergy, monks, diocesan administrators and officials of the Church were arrested, deported to the General Government, taken off to a concentration camp in the Reich, or simply shot. Altogether some 1700 Polish priests ended up at Dachau: half of them did not survive their imprisonment." Greiser's administrative chief August Jager had earlier led the effort at Nazification of the Evangelical Church in Prussia. In Poland, he earned the nickname "Kirchenjäger" (Church Hunter) for the vehemence of his hostility to the Church. "By the end of 1941", wrote Evans, "the Polish Catholic Church had been effectively outlawed in the Wartheland. 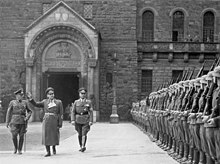 It was more or less Germanized in the other occupied territories, despite an encyclical issued by Pope Pius XII as early as 27 October 1939 protesting against this persecution." SS-Obergruppenführer Greiser actively participated in the Holocaust Early in 1940, Greiser is on record challenging Hermann Göring over efforts to delay the expulsion of Łódź Jews to Poland. On 18 September 1941, Reichsführer-SS Heinrich Himmler informed Greiser that he intended to transfer 60,000 Czech and German Jews to the Łódź ghetto until spring 1942, when they would be "resettled". The first transport arrived a few weeks later, and Greiser sought and received permission from Himmler to kill 100,000 Jews in his area. He then instructed HSSPF Wilhelm Koppe to manage the overcrowding. Koppe and SS-Sturmbannführer Herbert Lange proceeded to manage the problem by experimenting at a country estate at Chełmno nad Nerem with gas vans, establishing the first extermination unit which ultimately carried out the mass murder of approximately 150,000 Jews between late 1941 and April 1942. Furthermore, on 6 October 1943 Greiser hosted a national assembly of senior SS officers in Posen at which Himmler candidly spoke of the mass executions of civilians (the infamous Posen Speech). Greiser's mass murder operations were coordinated by SS-Oberführer Herbert Mehlhorn. On 20 January 1945, Greiser ordered a general evacuation of Posen (having received a telegram from Bormann relaying Hitler's order to leave the city). Greiser left the city the same evening and reported to Himmler's personal train in Frankfurt am Oder. There Greiser found that he had been tricked by Bormann. Hitler had announced that Posen must be held at all costs, and Greiser was now viewed as a deserter and coward, particularly by Goebbels, who in his diary on 2 March 1945 labeled Greiser "a real disgrace to the (Nazi) Party", but his recommendations for punishment after the capture of Poznań were ignored. He surrendered to the Americans in Austria with SS-Gruppenführer Heinz Reinefarth in 1945.
taking Polish children against the will of their parents or guardians, forcibly putting them in German families or public orphanages within the Reich while severing all contacts with their families and nation by giving them German names. The Tribunal decided that Greiser was guilty of all charges and sentenced him to death by hanging, civil death, and confiscation of all his property. In the early morning of 21 July 1946 he was transported from prison to the slope of Fort Winiary where he was hanged before a large crowd. It was the last public execution in Poland and Europe. Wikimedia Commons has media related to Arthur Greiser. ^ Evans 2009, pp. 482ff. ^ Epstein 2012, p. 45. ^ Epstein 2012, p. 52. ^ Kershaw 2000, p. 251. ^ Rees 1997, pp. 143-5. ^ Rees 1997, p. 142. ^ Rees 1997, p. 145. ^ a b Evans 2009, p. 34. ^ Epstein 2012, p. 224. ^ Epstein 2012, pp. 225-8. ^ Evans 2009, pp. 33-4. ^ Mark Mazower; Hitler's Empire - Nazi Rule in Occupied Europe; Penguin; 2008; ISBN 978-0-713-99681-4; p.92. ^ Epstein, Catherine (2012). Model Nazi: Arthur Greiser and the Occupation of Western Poland. Oxford University Press. pp. 231–232. ISBN 9780199646531. ^ Kershaw 2000, p. 484. ^ Kershaw 2000, p. 759n24. ^ Epstein 2012, pp. 334-5. ^ Bartłomiej Kozłowski (14 July 1946). "Powieszenie Arthura Greisera, gauleitera Kraju Warty ostatnia publiczna egzekucja w Polsce". Polska.pl (in Polish). Archived from the original on 14 July 2006. Retrieved 23 November 2008. Epstein, Catherine (2012) . Model Nazi: Arthur Greiser and the Occupation of Western Poland. Oxford University Press. ISBN 978-0-19-954641-1. Evans, Richard J. (2009). The Third Reich at War: 1939–1945. Penguin. ISBN 978-1-101-02230-6. Retrieved 13 January 2013. Kershaw, Ian (2000). Hitler 1936–1945: Nemesis. 2. New York City: W.W. Norton. ISBN 0-393-04994-9. Lumans, Valdis O. (1993). Himmler's Auxiliaries. Chapel Hill: University of North Carolina Press. ISBN 0-8078-2066-0. Rees, Laurence (1997). The Nazis: A Warning From History. New York City: New Press. ISBN 1-56584-551-X. Reitlinger, Gerald (1956). The SS: Alibi of a Nation 1922–1945. London: Arms & Armour Press. ISBN 0-85368-187-2.